Helicopter Photo Tour over Athens! Nothing in this world can be compared to moments spend with the love of your life, in a place like Athens in Greece. And what is better than booking your personal photographer to capture them ideally? With a long history dating back to the Neolithic age, Athens has been termed as the capital of Europe. The city of Athens is endowed with new freeways, ultra-modern subway, streets, and spotless parks. Thanks to the 2004 summer Olympics, Athens has blossomed. It offers more than just a stopover route when visiting Europe, as you will be presented with pillars of the western history, the National Archeological Museum, the Acropolis and its new Museum, Plaka area, Panathenaic Stadium, and so many others! 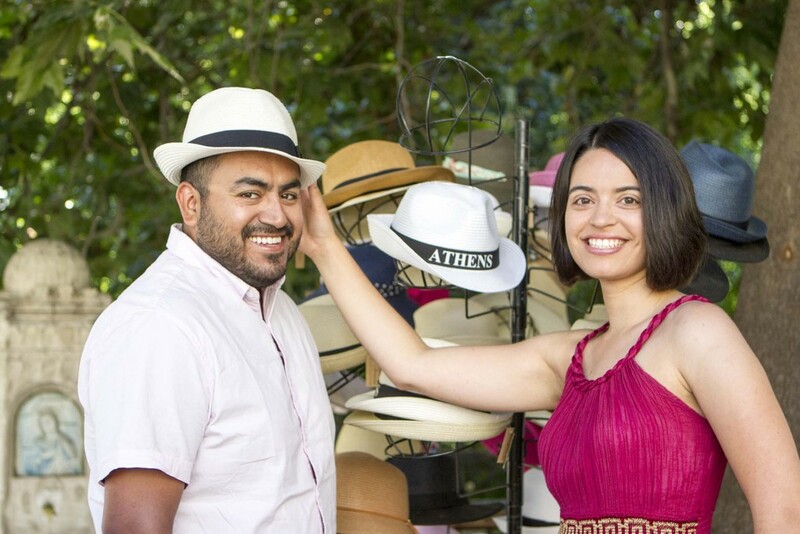 Right after taking photos in Santorini, Maria & Oscar would not miss anything in the world for a photo shoot in Athens. As a destination photographer, I was put to task because I was familiar with the itinerary the couple required. 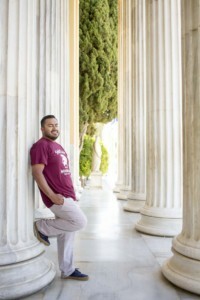 For their photo session, they would have preferred Acropolis, and I did not disappoint them. Armed with my most important tool for the job, I was ready to offer the couple the best time of their lives. The two looked adorable holding hands, and I made sure each photo would be a success. 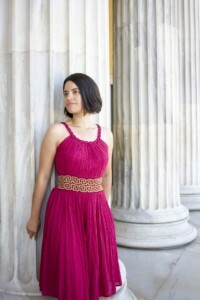 Request your romantic photo shoot in Athens now! I ensured I chose the most favorable spots for Maria and her husband. The chemistry between the couple could not be missed in each photo. It goes without much saying that they were enjoying each moment of the photo shoot. Maria’s brightly colored dress illuminated well with the background giving life to the pictures. The ruins at the Acropolis presented a backdrop that was ideal for each photo being taken. I took some steps back and captured various images of the couple from a distance. The view was beyond comparison, and the two made each moment exciting. At one point, Oscar posed alone, and he looked perfect with hands in his pocket. I, on the other hand, ensured each photo was appealing to the eyes, for them to share with family and friends when they went back home. 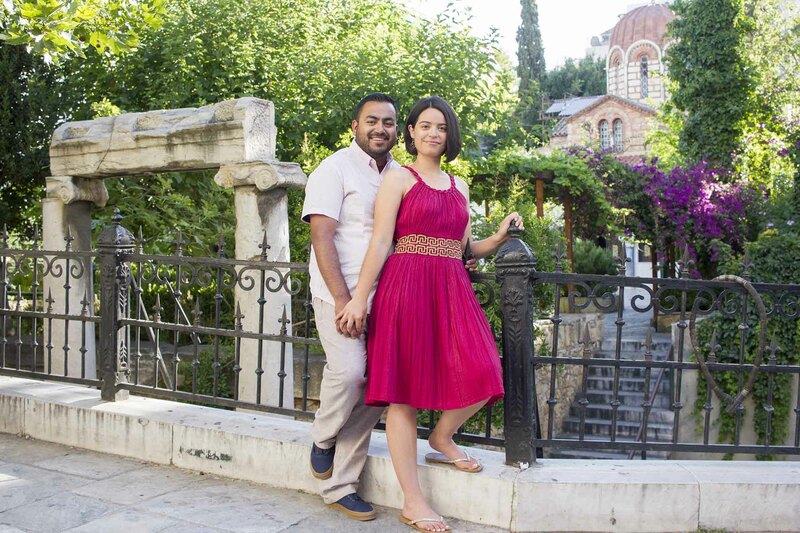 It was the best moments for two lovebirds to have a photo shoot around the Acropolis hill. Each moment counted, and it is without a doubt that they enjoyed their two-day stay to the very last minute. Maria and Oscar are an exact definition of the power couple. It can be seen with each picture taken. The moments spent with them taking photos were serene and full of laughter. Talk of adorable couples visiting one of the most beautiful places in the word. The sun shone brightly up in the skies making the day bright and lovely. Maria and her husband decided to put on sunglasses to shield their eyes from the scorching sun. Finally, they found a more relaxed area and sat down as I took various photos of them. Love makes the world to go around. These two were in their world enjoying each moment without a care in the world. It was not only fulfilling to see my clients happy together but also see them enjoying each moment of their photo shoot! PhotoWalksinAthens is a not just another photo tour. It is your link to photographically experience the city from an insider’s point of view and discover the heart and soul of the amazing city of old and modern Athens under fun and friendly guidance. Join us and fill your holiday album with amazing photos and unforgettable memories! Copyright 2016 | All Rights Reserved | Photo Walks in Athens.